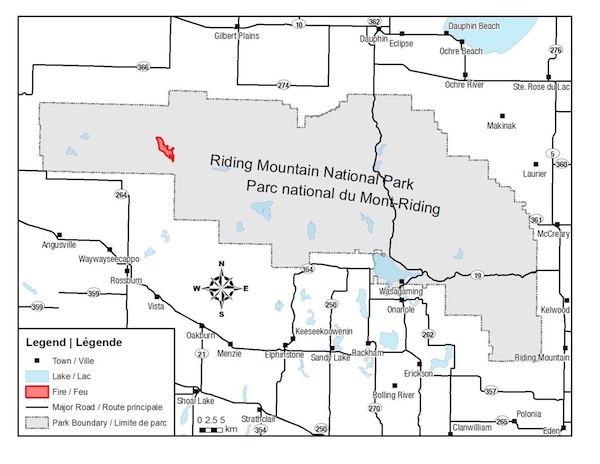 Officials in the western part of Manitoba have a wildfire in Riding Mountain National Park under control. The fire broke out in the Birdtail Valley on May 16, slowing moving across just under 700 hectares. On Monday, Parks Canada had one fire crew working to monitor the fire and control hot spots occurring on the fire’s flanks. Cooler temperatures are helping to limit the spread of the fire. In addition, the adjacent aspen forest is greening up and that may assist with the containment of the fire. There is no immediate danger to people or property, but those in the area may notice smoke. The fire is located about three kilometres inside the park boundary. Investigations revealed that this fire was human caused so the public is warned to use caution when lighting fires, and to ensure that they are properly extinguished before leaving the area. Visitors to the backcountry are advised to stay on marked trails and in designated campground areas.